When we first brought our rescue mutt, Lola, home, she bonded with me first, and my son was devastated. He was only 5, so he was too young to walk her on his own and made a mess every time we asked him to feed her. We had to find other ways for them to bond. Luckily, our new pet loved to play fetch, and my son could certainly toss a ball back and forth. “The bond between children and their dogs is undeniable and seldom needs encouragement,” says Katy Nelson, veterinary contributor to Pet360.com and host of The Pet Show with Dr. Katy. That said, it’s not like pets — or kids — come with instructions. There’s a learning curve involved for everyone. 1. Introduce them to the pack gradually. If the dog is part of the family first, a new baby can be quite stressful for the pet. Be sure to give the dog the attention it needs, so it doesn’t feel neglected. Take the baby with you when you go for walks and turn it into a family activity. “Dogs are pack animals, so they see the family unit as a pack with a definite power structure,” Sasi says. Whether they’re babies or school age, you don’t want the dog to consider children as subordinates. When bringing in a new pet, children should be introduced gradually with fun activities. 2. Teach them how to pet a dog. We taught our son to hold his hand out gently for Lola to sniff before he pet her; then we taught him how to pet gently, without tugging on ears or tails. There were a few bumps along the way, but the older my son got, the better he was about following this rule and la perrita came to trust that he was there to please him, not hurt him. “If you give a dog a lot of positive attention, you can’t help but build a strong bond,”Sasi says. 3. Let them sleep in the same room. Our dog, Lola, sleeps in a crate we’ve outfitted with a plush dog bed. The crate is at the foot of my son’s bed. Every once in a while we let her snuggle in bed with him, but most of the time she sleeps in her crate. Dogs hold their safe zones sacred, so having one in the child’s room can help forge that bond. 4. Have kids provide food and water — then back off. Dogs are extremely loyal to the person or persons who feed them. Our dog, Lola, is crazy about her Beneful Originals, so I showed my son how much to feed her as well as how to change the water bowl. If your child is too young, help him out but let him lead. Remember to teach kids to leave the dog alone once it’s comiendo, as this can cause a dog to feel territorial and snap. 5. Let them play. Have your niños play fetch with the dog, or visit a dog park and let them run and play together. The more fun a dog and child have together, the harder the dog will work to please his companion. 6. Make your kids the treat giver. Much like humans, dogs love treats! When the child comes home from school, try having him or her offer a treat to the dog, so that it begins to connect the child to something positive — and yummy. 7. Have them groom the dog. Some dogs love to be brushed or bathed. 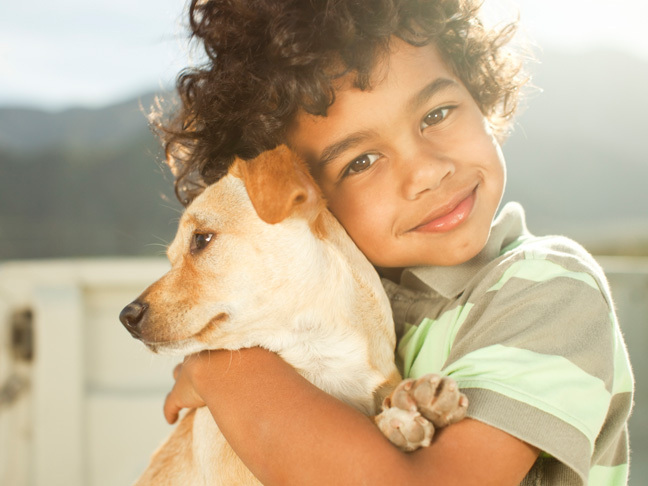 If yours is one of them, it’s a great opportunity for your child to bond with the dog. Show them how to gently brush or lather the dog. In our house we turn doggie bath time into a fun activity by letting our son wear his swimsuit while he bathes Lola. It inevitably turns into a play date of sorts, which our pup loves.